As a starting quarterback in college, Mirer went 29-7-1 and was co-MVP of the 1992 Sugar Bowl. 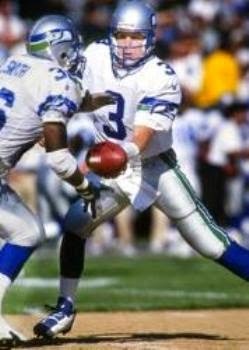 He set several career records at Notre Dame, including passing yards (5997) and touchdown passes (41) and was chosen by the Seahawks with the second overall pick in the first round of the 1993 NFL draft. Seahawks went 6-10 to finish fifth in the AFC West while leading the conference in rushing yards (2015). Mirer’s promising first season remained his best. He struggled in 1994 until knocked out of the last three games with a broken thumb, dealing with poor mechanics and a weak supporting cast. It got worse in ’95 when he tossed 20 interceptions and, after another mediocre year in 1996, he was traded to Chicago. Athletic but with a poor throwing arm, Mirer lasted a year with the Bears, was cut, and picked up as a third-string backup for the Packers in ’98. He saw no action that year and continued as a journeyman with the Jets, 49ers, and Raiders. Over the course of eight active seasons and 80 games, Mirer threw for 11,969 yards and 50 TDs with 60 interceptions while completing 53.3 percent of his passes and averaging only 5.9 yards per attempt.